Update: So Butterflies, it's been a little over three months since I told you guys that I was going to try out the new SLIMQUICK Pure Extra Strength Gummies, well I did and I had an ok experience. Chewing the gummies takes some getting use to, making better meal choices and moving your body defiantly helps with getting results. I only lost about ten pounds this time and I'm sure it's because I wasn't as active as I should have been and I had more cheat days than I should have. I've tried and really liked the original SLIMQUICK products in the past so much that I had absolutely no hesitation when it came to trying the new SLIMQUICK Pure Extra Strength Gummies. SLIMQUICK is honestly the only over the counter weight lost supplement that I've actually saw results with. I followed their meal suggestions, got more active and took the supplements as directed which worked great for me. I lost over twenty pounds following this routine in the past. SLIMQUICK Pure Extra Strength Gummies are sweet and juicy mixed berry flavored and are all-natural and free of artificial colors. SLIMQUICK Pure is designed to help women lose 3 time the weight in 13 weeks. It's exclusive natural extract is said to be so potent, it makes SLIMQUICK Pure the most effective female weight loss supplement. SLIMQUICK Pure has isolated the fat burning components in green tea that speed up your metabolism better than any unhealthy chemical ingredient. SLIMQUICK Pure with BioPure Green Tea allows for three times the absorption of fat burning agents called catechins, and you can lose three times the weight. 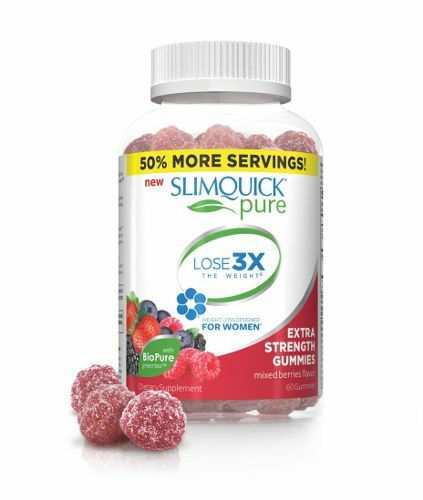 Save $5 on SLIMQUICK Pure Extra Strength Gummies! Required Legal: *A clinical study has shown that overweight women using SLIMQUICK Pure's key ingredient, along with a 1350 calorie diet, lost 25 pounds vs. 8 pounds with diet alone in just 13 weeks. Copyright 2014. All rights reserved.